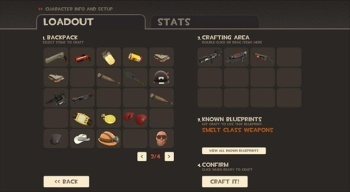 Valve is introducing crafting to Team Fortress 2, giving players a chance to finally do something with all that useless crap they've been lugging around in their inventories. Crafting, the technical term for the art of turning crap into other kinds of marginally-less-useless crap, has historically been an RPG-focused activity and not the sort of thing your average online FPS really paid attention to. But no longer! All those months of carrying around duplicate weapons, stupid hats and other assorted garbage you have absolutely no use for are finally going to pay off. Valve is releasing a series of "blueprints" that will provide formulas detailing how various objects can be combined into other items that are actually useful for something; other blueprints will remain secret until players figure them out. "Think of blueprints as recipes, but instead of making Chicken Cordon Bleu, they make guns!" the company wrote on the TF2 blog. "And hats! And Sandviches, which in retrospect would have helped our analogy better if we'd mentioned that first." As an example, a "smelt primary weapons" blueprint was posted to illustrate how excess guns could be put together to create "useful scrap metal." Clearly, not every crafted item is going to be a game-changer, but it's better than having 27 jars of Jarate lying around. TF2 crafting isn't available quite yet (I just blew a half-hour "checking") but should go live fairly soon, so keep your eyes peeled!